The idea behind National Nutrition Month is to ensure that we make informed choices when we decide what and how much to eat. It allows us to develop healthy eating and physical activity habits that our bodies deserve! 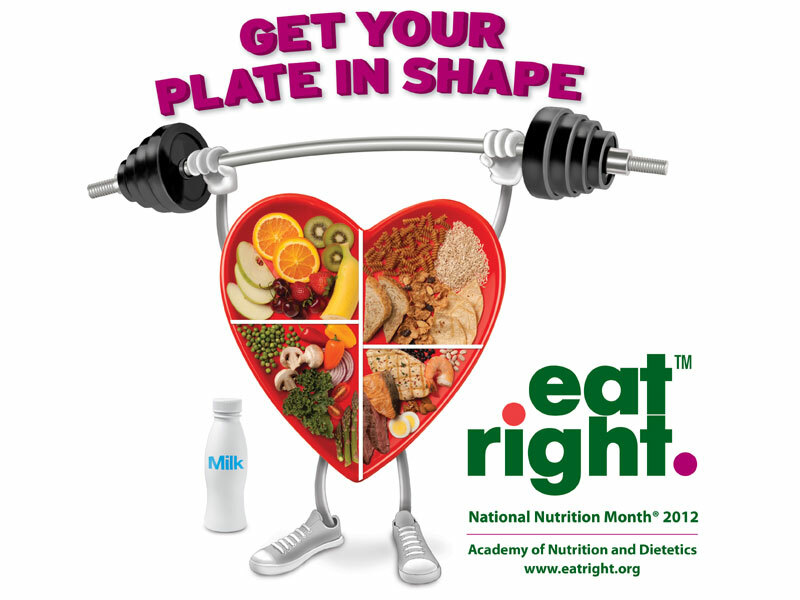 The theme of 2012, “Get Your Plate in Shape!” can mean different things for different people. But its main goal is to encourage us to pay attention to exactly what is on our plate before we start eating! Cook more often at home where you are in control of what’s in your food. When eating out, choose lower calorie menu options. Avoid choosing an appetizer, side, entrée and a dessert – choose only 2-3 options as part of your meal. Brian Wansink – a famous scientist who studies how the environment affects our decisions of what and how much to eat – demonstrates how easily we can be tricked to over eat! In one of his experiments, he gave 86 nutrition experts medium-sized or small bowls with ice cream. He found that the group with the larger bowls ate 53% more ice cream than those with the smaller bowls without even realizing it and both groups reported being equally satisfied. This illustrates that it is important to be mindful when we eat and a simple way to avoid being tricked is to eat from smaller bowls and normal-sized plates. Variety is the name of the game! Pick from dark-green, red and orange vegetables. Add beans and peas too! Add 1 -2 servings of fruits and vegetables in each meal. Brown rice, barley, oats, and whole-grain breads, cereals and pastas are great choices for your sides and ingredients. Check the ingredients list on food packages to make sure “whole-grain” is listed as one of the first few ingredients. Choose fat-free and low-fat milk because they have the same amount of calcium and other essential nutrients as whole milk, but less fat and calories. Choose from a variety of foods from the protein food group each week: seafood, nuts, beans, lean meat, poultry and eggs. Eat more plant-based protein: nuts, beans, whole soy foods (like edamame and tofu). Limit your meat and poultry to 3 ounces per meal and make it lean. Choose fish as your protein source at least twice a week. Choose “reduced sodium” or “no salt added” when buying canned items. Compare sodium in foods and choose those with the least amount. Rinse your canned vegetables to reduce sodium levels further. Switch from solid fats (butter, lard or shortening) to healthy oils like olive, canola and sunflower oil. Drink water instead of sugary drinks like sodas, fruit flavoured drinks and sweetened teas/coffees. Engage in physically activity for at least 2 hours and 30 minutes every week. You can split this into 10 min exercise, three times a day to stay motivated. Choose activities that you enjoy, and start by doing as much as you can.